Capitol Paving of DC (the contractor) continued the work along the eastbound side of Kennedy Street NW; they also started the work on the westbound and eastbound along Kennedy Street between Georgia Ave NW and North Capitol Street NW. 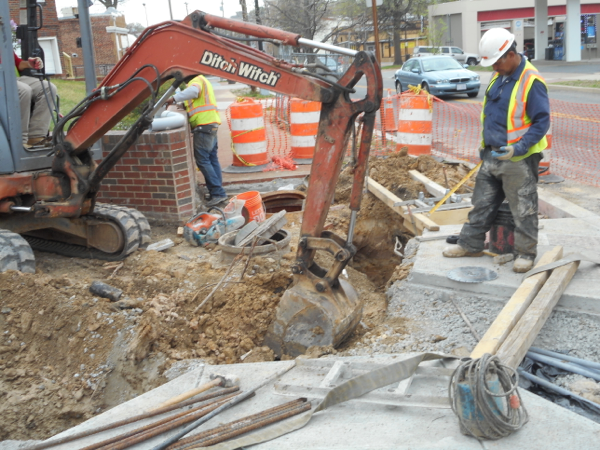 The contractor furnished and installed one (1) manhole at Missouri Ave NW, one (1) water meter with hosing frame and cover and 44 linear feet of water service pipe. They also poured 10 cubic yard of 4” sidewalk, 93 square yards of brick sidewalk, 4 linear feet of straight granite curb and about 33 linear feet of circular granite curb. Capitol Paving also poured three (3) bus pads at 5th Street and 4th street and 3rd street intersections and construct two (2) wheelchair ramps Jaxson Point (Capitol Paving’s sub-contractor) performed the electrical work by installing 143 linear feet of six (6) 4” electrical conduit, 3135 linear feet of #0000 strand wire and 1045 linear feet of #0002 strand wire. DDOT technician performing compaction Test from MH-1 to MH-5. Capitol Paving of DC (the contractor) continued the work along the eastbound side of Kennedy Street NW; they also started the work on the westbound and eastbound along Kennedy Street between Georgia Ave NW and North Capitol Street NW. The contractor furnished and installed one (1) standard double basin, 54 linear feet of 15” RCP pipe and 22 linear feet 18” RCP pipe. They also poured 15.33 cubic yard of 4” sidewalk and 2 square yards of brick sidewalk on PCC base. Besides Capitol Paving installed 2 wheelchair ramps and supplies 35.66 cubic yards of sandy base structural soil. 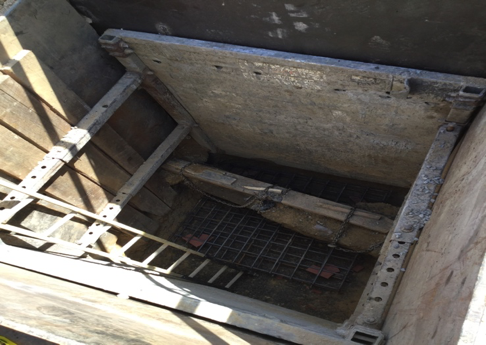 Also, they installed 111 linear feet of water service pipe and 3 water meters’ frames and covers. 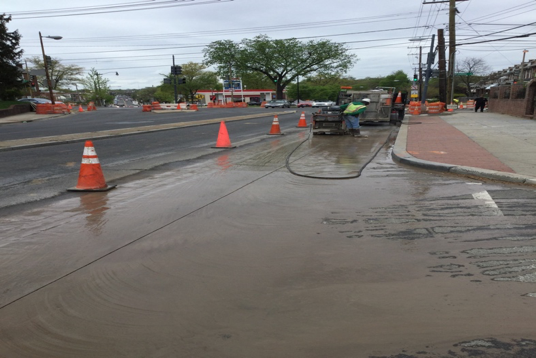 Jaxson Point (Capitol Paving’s sub-contractor) performed the electrical work by installing 41 linear feet of four (4) 4” electrical conduit, installing four (4) traffic signals/streetlights on temporary PCC bases, and installed 2-15 inches BC steel transformer base. Building #102 house service tap in to main service. Capitol Paving of DC (the contractor) continued the work along the eastbound side of Kennedy Street NW; they also started the work on the westbound and eastbound along Kennedy Street between Georgia Ave NW and North Capitol Street NW. 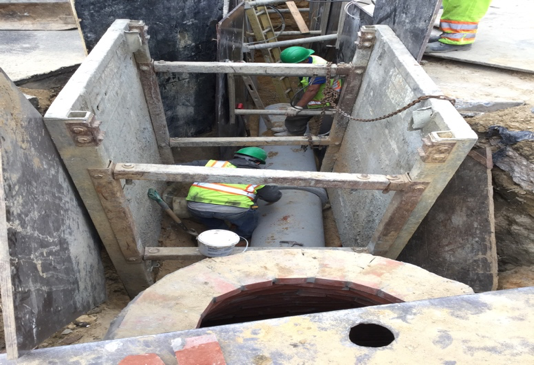 The contractor furnished and installed 111 linear feet of water service pipe, two (2) Standard 4’ diameter manholes, one (1) standard double basin, 71 linear feet of 15” RCP pipe, relocated 4 water meters and installed four (4) water meter hosing and frames. In addition, the contractor abandoned one (1) basin connection pipes and one (1) basin. They also installed 58 square feet of brick sidewalk and laid 51 linear feet of brick gutter. Jaxson Point (Capitol Paving’s sub-contractor) performed the electrical work by installing 54 linear feet of four (4) 4” electrical conduit, installed thirty (30) LF of 1-2” & 1-4” PVC conduit, installed four (4) traffic signals/streetlights on temporary PCC bases, installed 37 linear feet of six (6) 4” inch PVC conduits and installed 59 linear feet of (6) 4” and (1) 4” inch PVC conduits. Capitol Paving building SMH108 at the south-east corner of Kennedy Street and 1st Street intersection. Capitol Paving excavating for fire hydrant relocation at station 611+00RT to 611+08RT. Capitol Paving formed wheelchair ramps at the south-east corner of the 4th Street and Kennedy Street intersection. 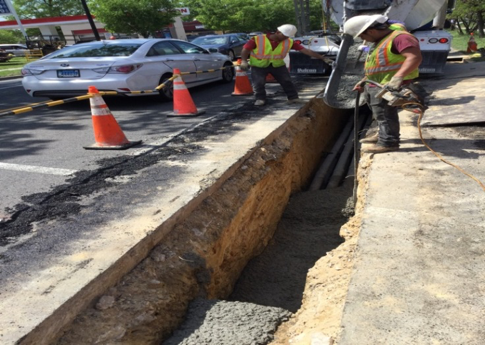 Capitol Paving of DC (the contractor) continued to work at the 1st Street and Kennedy Street intersection constructing sewer manholes, excavating for the installation of connection pipes/pipe runs and backfilling completed utility trench work. 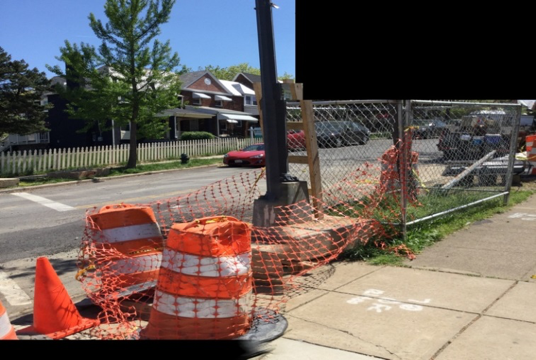 Capitol Paving has also begun removing trees along the south side of Kennedy Street between 2nd Street and 1st Street in preparation for the upcoming street renovations. 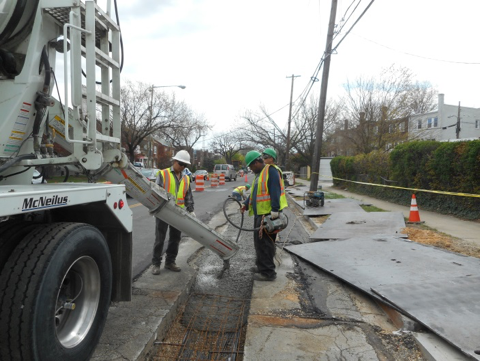 The contractor completed various drainage work at CB #21 and began working at CB#30 on Missouri Avenue between the cross streets; 2nd Street and Kennedy Street. Capitol Paving installed and backfilled the SL MH #14 on Missouri Avenue and begin excavating the conduit trench from MH #14 to MH #13. Capitol Paving has continued to complete work at the 4th Street intersection with Kennedy Street; excavating the sidewalk at the south-east corner to complete test pits to locate the existing water line, constructing new wheelchair ramps at the intersection corners, removing the existing PCC sidewalk from Sta.41+25RT to Sta.41+60RT to pour new concrete sidewalk and install brick gutter on the south west corner. 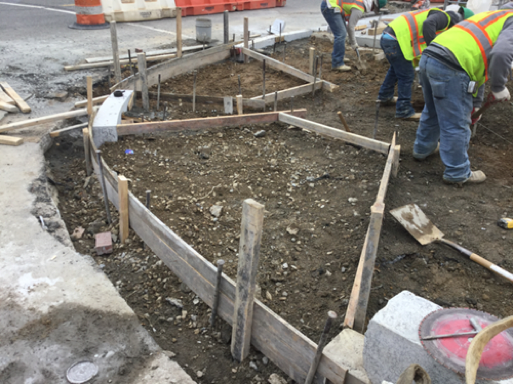 Subcontractor Jaxson Point Electrical continues working on the installation of electrical conduit from MO-2 to MO-3 and MH #15 to MH #13, and installing traffic signals on temporary concrete bases at the intersection of Kennedy Street and Kansas Avenue. 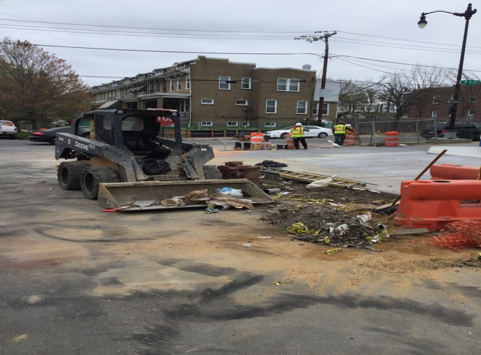 Contractor excavating for placement of electrical manhole, M6 at Sta.508+10LTplacing forms for ADA ramps and stairs leading to businesses. Capitol Paving of DC (the contractor) continued the work along the eastbound side of Kennedy Street NW; they also started the work on the westbound and eastbound along Kennedy Street between Georgia Ave NW and North Capitol Street NW. The contractor furnished and installed Standard 6’ diameter manhole, 25 linear feet 15” RCP pipe and 35.5 linear feet 18” RCP pipe. They also laid about 106 square feet of brick sidewalk. 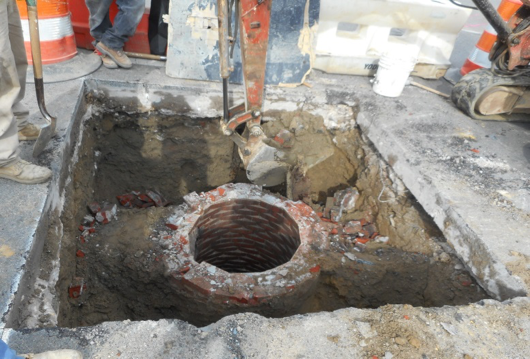 On the other hand, the sub-contractor Jaxson Point performed the electrical work by installing three (3) traffic signal/streetlight on temporary PCC base, two (2) 36”X36”X36” electrical manhole and three (3) 48”X48”X48” electrical manhole.